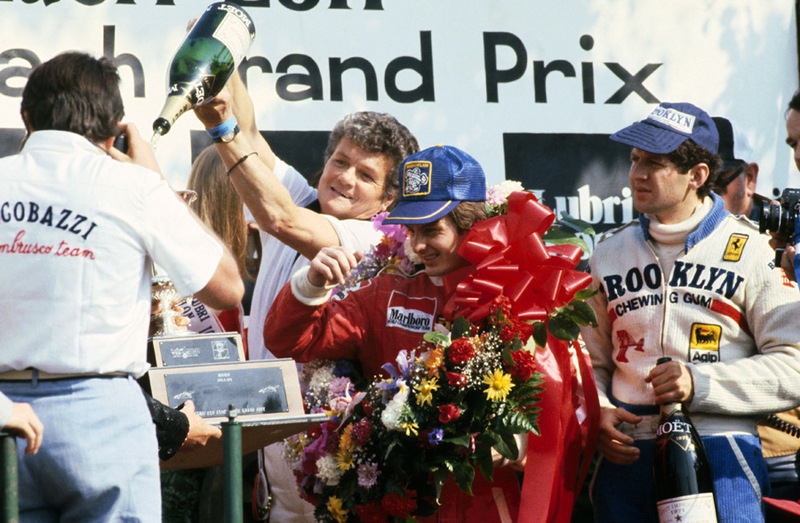 Gilles Villeneuve recorded his third win of the season in the USA Grand Prix at a wet Watkins Glen. The title had already gone to his Ferrari team-mate Jody Scheckter but Villeneuve was determined to prove he was a championship contender. The practice sessions and race itself took place in rain and drizzle. On the Friday, Villeneuve wrote his way into F1 folklore when he ventured out in appalling conditions as most of his rivals sheltered in the pits. "When we saw him going out in the rain, we said, 'This we've got to see'," renowned F1 journalist Dennis Jenkinson recalled. "Some members of the press, who think they know it all, don't bother going out when it rains. But I was on the corner watching him and all the hardball members of the press were with me. We had to see this. It was something special. Oh, he was fantastic! He was unbelievable!" "The speed he was travelling at didn't bear any relation to anybody else," said journalist Nigel Roebuck. "He was 11 seconds faster. Jody was next fastest and couldn't believe it, saying he had scared himself rigid! I remember Jacques Laffite in the pits just giggling when Gilles went past and saying, 'Why do we bother? He's different from the rest of us. On a separate level'." On returning to the pits, Villeneuve whipped off his helmet and beamed at the assembled members of the paddock, who were looking on in disbelief. "That was fun," he said. "I was flat in fifth on the straight, about 160mph. It should have been faster but the engine had a misfire and was down about 600 revs. But for that I could have gone quite a bit faster, but then maybe I would have crashed." In the race, all but two of the starters began on wet-weather tyres (Mario Andretti and Nelson Piquet the exceptions). Villeneuve made a brilliant start from the second row, leading Alan Jones. On the second lap Carlos Reutemann crashed while in third when his fire extinguisher sensor unit came loose and jammed his pedals. Jones took the lead after a pit stop but almost immediately lost a rear wheel which had not been secured properly by his mechanics. Scheckter moved up to second before his rear tyre exploded, allowing Rene Arnoux to take up the chase. Laffite (Ligier) took over third place from Jean-Pierre Jabouille's Renault, who promptly spun and allowed Clay Regazzoni (in his last race for Williams) onto the podium. Derek Daley had an interesting day for Tyrrell. He tangled with team-mate Jean-Pierre Jarier - the latter claimed he had been forced off the track - and then crashed seven laps from the end while lying fourth. Although he finished 48 seconds ahead of Arnoux, Villeneuve said he had been nursing his car home for 25 laps. "I had falling oil pressure and did not want to damage the engine."